The description of the events of war by eyewitnesses may be dated back to the time when Caesar reported his campaigns in Gaul; and old Froissart, the chronicler of England's early strife with France, may be looked upon as a medieval war correspondent. Strictly, however, this particular feature of latter day journalism began with the Crimean War, when The London Times sent a young Irishman, a barrister of the Middle Temple, to the east to record the deeds of England's armies. 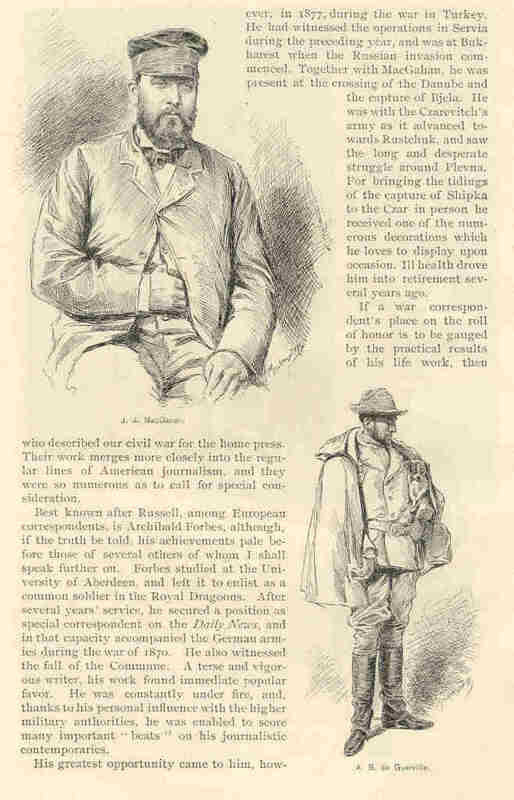 This pioneer correspondent was William Howard Russell, who is alive today, a hale old veteran of seventy-four years. He witnessed every important battle of the Crimean campaign, and watched the progress of the siege of Sebastopol from the trenches of the besiegers. Of course, as an Englishman's, his letters were not infrequently colored by national prejudice. Though in a lesser degree than Kinglake, he failed to give the French the credit due to them for their preponderant share in the honors of victory. He also had a habit of magnifying the numbers of the enemy to an inordinate extent whenever they were opposed by British troops. Yet with all his failings Russell was a thoroughly capable newspaperman. He was the first to expose the commissariat system, and the wanton neglect of the troops by the home authorities, which led to such untold suffering during the terrible winter of 1854-'55. His revelations produced a storm of public indignation throughout England, and were followed by the resignation of the Aberdeen ministry. 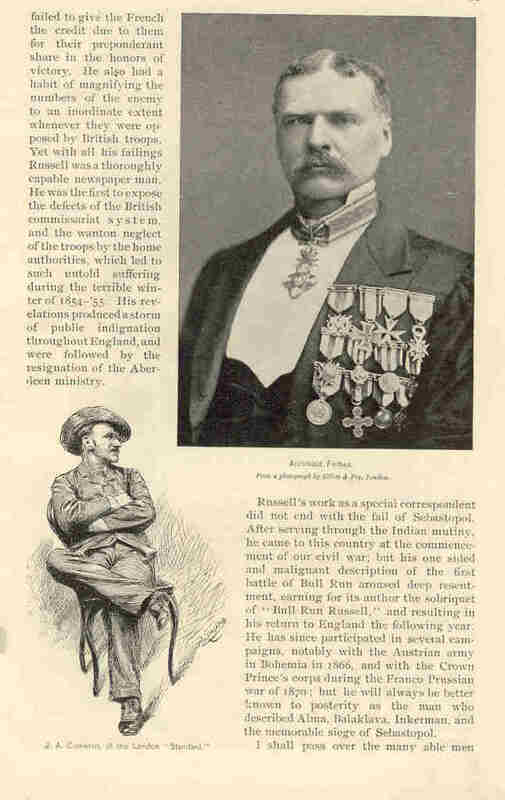 Russell's work as a special correspondent did not end with the fall of Sebastopol, After serving through the Indian mutiny, he came to this country at the commencement of our civil war; but his one sided and malignant description of the first Battle of Bull Run aroused deep resentment, earning for its author the sobriquet of "Bull Run Russell," and resulting in his return to England the following year. He has since participated in several campaigns, notably with the Austrian Army in Bohemia in 1866, and with the Crown Prince's Corps during the Franco Prussian war of 1870; but he will always be better known to posterity as the man who described Alma, Balaklava, Inkerman, and the memorable siege of Sebastopol. I shall pass over many able men who described our civil war for the home press. Their work merges more closely into the regular lines of American journalism, and they were so numerous as to call for special consideration. Best known after Russell, among European correspondents, is Archibald Forbes, although, if the truth be told, his achievements pale before those of several others of whom I shall speak further on. Forbes studied at the University of Aberdeen, and left it to enlist as a common soldier in the Royal Dragoons. After several years' service, he secured a position as special correspondent on the Daily News. and in that capacity accompanied the German armies during the war of 1870. He also witnessed the fall of the Commune. A terse and vigorous writer, his work found immediate popular favor. He was constantly under fire, and, thanks to his personal influences with the higher military authorities, he was enable to score many personal "beats" on his journalistic contemporaries. His greatest opportunity came to him, however, in 1877, during the war in Turkey. he had witnessed the operations in Servia during the previous year, and was at Bukharest when the Russian invasion commenced. Together with MacGahan, he was present at the crossing of the Danube, and the capture of Bjela. He was with the Czarevitch's army as it advanced towards Rustchuk, and saw the long and desperate struggle around Plevna. For the bringing of the tidings of the capture of Shipka to the Czar in person he received one of the numerous decorations which he loves to display upon occasion. Ill health drove him into retirement several years ago. If a war correspondent's place on the roll of honor is to be gauged by the practical results of his life work, then should the name of Januarius Aloysius MacGahan take preference of all; for to his direct influence is ascribed by many the upheaval which curtailed Ottoman power in the Balkan peninsula. MacGahan was a native of Perry County, Ohio, and had already distinguished himself as a fearless news gatherer long before the outbreak of the Russo Turkish war. As a correspondent of the New York Herald, in 1871, he had reported the disastrous retreat of Bourbaki's army into Swiss territory. He had stayed in Paris after the outbreak of the Commune, and but for the intercession of United States Minister Washburne, might have suffered severely for his intimacy with the rebel leaders. A visit to Russia after this gave him the opportunity of cultivating the friendship of many officials of influence, and when in 1873 the proprietor of the Herald ordered him to join General Kaufmann's expedition to Khiva, he was enabled, despite the government's refusal of a safe conduct, to accomplish his purpose. He started off alone through the desert on horseback, and overtook the expeditionary forces just before the commencement of the assault on the Khan's capital. The fight occurred at nighttime, and MacGahan was in the thick of it, side by side with his friend Colonel Skobeleff. His description of the affair raised him to the front rank of contemporary newspaper writers. Throughout the war with Turkey MacGahan remained in the saddle. His friend of the Khivan campaign, Skobeleff, had become a general, and the two were almost inseparable. His letters from the front are among the best contribution to the history of that bloody struggle, during which he suffered all the privations of the common soldier. Then, while the negotiations of San Stefano were in progress, he remained in Pera during an epidemic of spotted typhus, and fell a victim to the disease. His death was deeply mourned by the Russian army, among whom he had made himself a universal favorite. Alone, perhaps of the entire staff of foreign correspondents, he won the full confidence of the Russian leaders, and thus created for himself sources of information denied to his colleagues. This same war of 1877 was a great school for the modern news gatherer, and produced a veritable galaxy of journalistic geniuses. It is notable that many of the most prominent among them were Americans. There was John P. Jackson, for instance, who organized the post road service from Ploestic to Roumania to the Austrian frontier, thus avoiding the Russian military censor. it necessitated the constant use of thirty horses, and cost the New York Herald and the London Daily News conjointly large sums of money, but it enabled these two papers to print Forbes' account of the passage of the Danube twenty-four hours ahead of their contemporaries. Frank Millet - the distinguished painter of today - was another journalistic hero of that campaign. He was an American art student in Paris when Mr. Bennett sent him to Bulgaria to cooperate with Jackson. Millet did some of the most brilliant reporting of the war. He wrote for the Herald and the Daily News, and sent sketches to the Graphic. He crossed the Danube at Braila with Zimmerman and was one of the four correspondents to accompany the Russian army to San Stefano. Of these four men, three - Millet, MacGahan, and Grant of the New York Times - were Americans born and bred. Millet's most brilliant feat was his stirring account of the last battle of Plevna, a literary production that has been wrongly ascribed to Forbes - who, by the way, was constantly receiving credit for work performed by his more modest colleagues. Frederic Villiers - primarily a war artist, can lay claim to a more varied experience in the field that perhaps any of his fellows. He was the fourth man in the quartet that followed the Russian Army to the gates of Constantinople. He has also done service in Afghanistan, in Egypt, in the Soudan, in Servia, and in Burma, and everywhere he has been in the thickest of the fight. Of the four correspondents present at the battle of Metemneh on the Nile, he alone escaped unscathed, wjile J.A. Cameron of the Standard and St. Leger Herbert of the Morning Post were killed outright, and Colonel Burleigh of the Daily Telegraph was wounded. The Egyptian campaign proved the doom of several other brave members of the journalistic fraternity. Captain W. H. Gordon of the Manchester Guardian, Colonel Fred Burnaby of the Morning Post, and Edmund O'Donovan of the Daily News all found their graves amid the parched sands of the Soudan deserts. The two last named had previously made records for themselves in MacGahan's tracks in Central Asia. To return to the war of 1877, mention should not be omitted of that effective work of that other famous artist correspondent, Melton Pryor of the Illustrated London News, nor of Colonel John A Cockerill, representing the Cincinnati Enquirer with the Turkish Army. Some of the German and Russian correspondents, notably Huhn & Schneider of the Colnische Zeitung, Nemirovitch-Danchenko of the Golos, and Nicholas Mazimoff, are also well worthy of notice. The latter received two crosses for personal bravery in the field, and was wounded at Plevna. He is at present occupying a modest position in the office of the New York Herald. This same journal, it should be added, was the only American periodical to send a correspondent to the scene of the Franco Chinese difficulties in Tonquin. It's representative, Colonel William H Gilder, distinguished himself by reporting the defeat of Colonel Bouet ahead of all his colleagues. The present trouble in the east has not developed as much talent in the line of special war correspondence as its predecessor. There is a reason for this. The press of both hemispheres refused at first to take the quarrel between the two Mongolian powers seriously. No American editor, at least, believed for a moment that the hostilities would involve the most accepted principles of modern warfare, and prove an object lesson to naval and military authorities alike. Finally, when the Japanese began to show their mettle, Mr. Pulitzer of the World, decided to send out James Creelman to the theater of hostilities. The gentleman found, on reaching Japan, that the London Times, Black and White, and Paris Temps, and several German, Italian, and Russian periodicals had also but just provided themselves with capable representatives. In short, active hostilities were already far advanced before any of the correspondents reached the actual scene of the fighting. None of them witnessed either the early naval movements in the Gulf of Petchili, nor the land operations that culminated in the battle of Ping Yang. However, no one personally acquainted with Mr. Creelman could have doubted that even at that late date he would make a record for himself, as certainly he has done. Creelman is made of the clay from which spring crusaders, reformers, and martyrs. His judgment may often be open to question; his good faith, sincerity, loyalty, perseverance, and manliness never. Barely thirty-four years of age, Creelman has passed through more experiences than ninety-nine hundredths of his fellow craftsmen. He began work for the Herald during his teens, accompanied Boyton on a floating trip down the Mississippi, took part in several ballooning expeditions, obtained a taste of cowboy life in the West, and wnet through the entire routine of a city reporter before the age of twenty seven. After that he was sent to Europe by Mr. James Gordon Bennett, and as special correspondent interviewed many of the leading celebrities of the day, from the Pope to Count Tolstoi. He then returned to this country, only to be packed off to Hayti, where he met the redoubtable Hippolyte. He has been managing editor of the London and Paris editions of the New York Herald, and of the New York Evening Telegram. After Creelman's departure for the extreme orient, the New York Herald, not to be outdone, arranged to publish sketches by Frederic Villiers, who had gone to Asia to represent Black And White' and also agreed to take "copy," at space rates, from A. B. de Guerville, a journalistic freelance who had started for Japan on his own account. Harper's Weekly, on the other hand, sent Julian Ralph to Shanghai to report events from the Chinese side. After the battle of Ping Yang, which place they reached shortly after the flight of the Chinese, the correspondents accompanied Marshal Oyama's army in its advance on Port Arthur. it was the capture of this ill fated city, on November 21, that led to the heated newspaper controversy with which the American public has been regaled for two or three months. Creelman, who until this event had been lavish in his praise of Japanese humanity towards the defeated foe, suddenly exploded the startling declaration that the Mikado's troops had been guilty of unheard of atrocities. These he declared he had witnessed himself during the three days following the capture of the town. His accusations called forth a chorus of denials from Japanese officials, but none louder than those of de Guerville in the columns of the Herald and Leslie's Weekly. Abundant evidence has, however, been brought forward to show that Creelman spoke the truth. 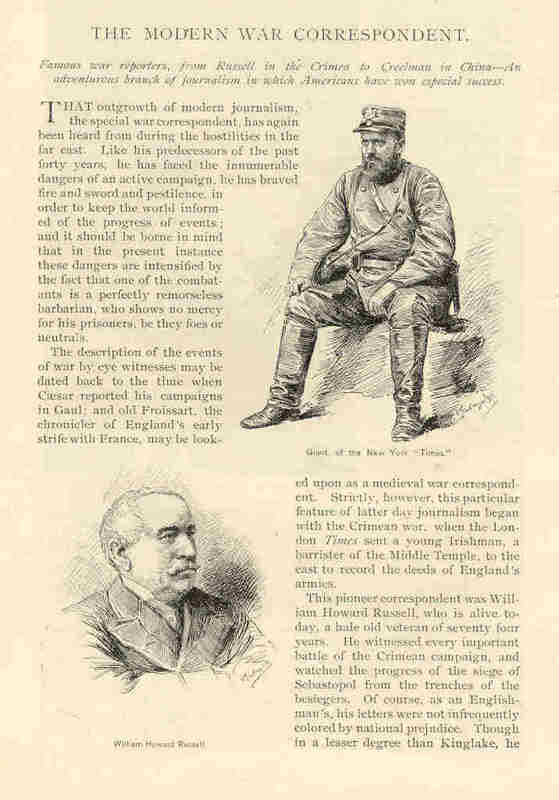 Even the Herald's artist, Villers, not to mention Mr. Cowan of the London Times, and many American naval officers, all present on the occasion, have since fully corroborated his story; Villiers backing up his testimony with irrefragable proof in the shape of photographs taken on the spot. For the first time in history, the Herald has been outdone in the field of war correspondence. Tempora mutantur. Originally published in Munsey's Magazine, April 1895.